One of my favorite memories from last summer was enjoying an outdoor concert in the grass at the Huntington Library lawn in Pasadena, CA. Everyone brought lawn chairs, picnic blankets, and a stash of goodies including wine. 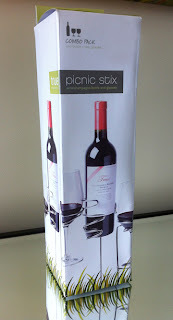 If only I had known about Picnic Stix then, I would not have spilled my perfectly chilled glass of Chardonnay while searching for a hard surface to place it on. Picnic Stix allows you to set your glass and even an entire bottle into these nifty yard sticks that anchor securely into the grass. Now if only that couple next to me hadn't practically set up camp on my lap, it would have been a perfect evening! Sep 13 Setting The Bar: Filming Has Started!